It’s 10 years since Eye Opticians opened a branch in Barnt Green’s Hewell Road, and countless villagers have had their eyecare needs looked after by Shafik Haji and his team. The practice is now sporting a smart new look, but the friendly service and wide choice of affordable and designer frames remains constant. “We believe in giving the best service and going out of our way to make customer satisfaction a priority,” says Shafik, who qualified as a dispensing optician more than 30 years ago and founded the original branch of Eye Opticians in Edgbaston. 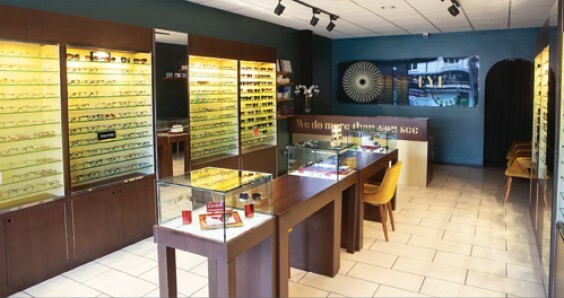 Eye Opticians offers some of the best frames from around the world, along with quality Japanese and German lenses at the most competitive prices – all backed with a two-year guarantee and offer price guarantee. Prices start at just £49 (frames and lenses) for those who want simple glasses that are still on trend. Along with exclusive brands like Cartier and Chanel, the designer collection has grown to encompass the likes of Gucci, YSL, Tom Ford, Oliver Peoples, Etnia and Modo. Shafik has recently introduced new brands from France and Italy designed specifically for women, such as Res Rei, Lara D and Coco Song. For gents there are brands like Lindberg, Starck, Jf Rey and Cutler & Gross. Meanwhile, children’s frames start from £9. Services include standard eye examinations, enhanced eye examinations, dry eye clinics, and a full contact lens fitting service including varifocal contact lenses. Eye Opticians also provides clinics to diagnose and manage conditions like visual stress and photo-sensitive migraines. The firm is always investing in the latest technologies for both Barnt Green and Edgbaston, to give the most advanced eye examinations. Equipment such as the VisionX 120 diagnostics, Heidlberg Spectralis OCT and Zeiss HF3 visual fields screener is the gold standard – as used in eye hospitals – for the early detection of glaucoma, macular degeneration and other conditions. By monitoring changes over time the prognosis is much better. And it’s not only clients’ eyes that are looked after – Eye Opticians even supplies and fits hearing aids in partnership with The Hearing Care Partnership. To celebrate this milestone, Eye Opticians is giving customers a special offer (see below), and also holding an Open Day at the Barnt Green branch on Saturday April 6. Pop along between 9am and 5pm to see the latest collection of Tom Ford frames and sunglasses, and take advantage of special offers and a prize draw.